Happy T Day everyone. Another T Day already. Summer is going by way too fast for me. I want to get a beautiful day and just stall it for a while. Stop by Bleubeard's and Elizabeth's blog to join in the T fun and to see what all the Tuesday T gang has been up to. If you've never joined in, just post something that has to do with drink (it doesn't have to be tea) and/or food. 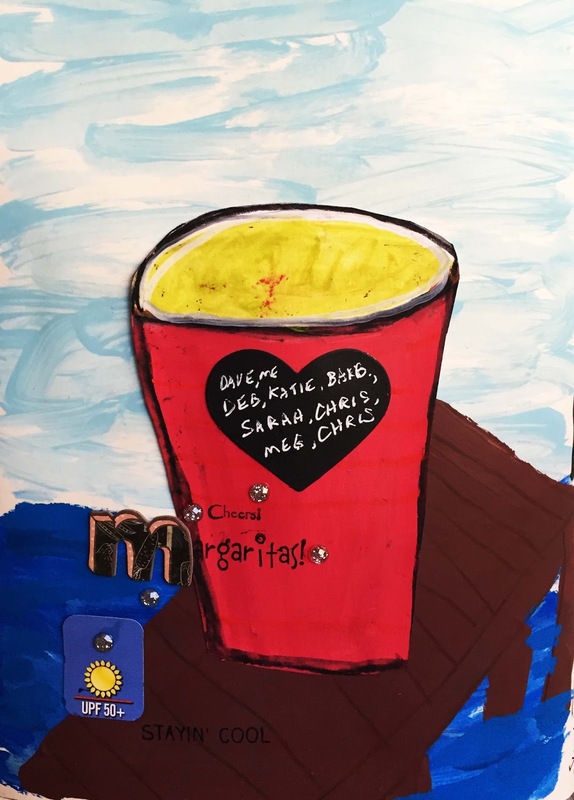 Today I have some journal pages to show you with a "drink" theme. These are from my summer journal I am keeping. Margaritas on the dock a couple of Sunday afternoon's ago. Back when it was still June. Can you make out my doodled (not so great) glasses on the bottom left? And one more T themed photo to show you. This is my mom. She is 86 and has some memory issues. She was thrilled for a little jaunt out of the assisted living where she is now. Her new apartment is actually really nice-she is a happier woman than I ever remember her. I went to see her 2 weeks ago and we went out for lunch. Just cheese burgers and fries, nothing special, but we had a nice afternoon together. This is my mini-frappe with the giant straw, which I loved the size of- just enough- and Mom. Somehow I missed her mug of coffee in the photo. Quiet week on my agenda. I think. I hope. Summer vacation mode has really set in. The humidly is due back as the week goes on and I have a few little "projects" I want to do around the house. And just be in my slow summer mode for a little bit. Thanks for stopping by ans visiting. AH! Perfect pages in your summer journal. I could never keep one so detailed, but I love yours. I don't think the words would be a problem for me, but the drawing would not be good. Your drawings are super and I adore every page and image. Your mother looks so happy. I bet you bring it out in her, too. No need to show her coffee, because I saw the cream container on the table, which wasn't much smaller than your frappe. Loved it. Thanks for sharing your journal and your day out with your mother for T this nearly Tuesday. 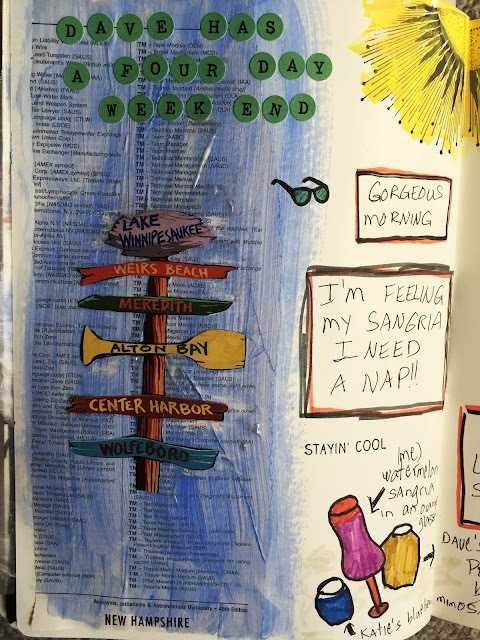 oh what lovely summer memories in your journal pages.... LOVE your new header! Your Mom looks very happy indeed -and how nice you spent another special time together. haha, Feeling the Sangria, Need a nap... love your journaling. your mom really Looks happy, great you had some good time together. enjoy your "slow" summer! happy t-day! Pretty drawings and your mom has a sweet smile. What a wonderful outing for you and your mom. Have a happy day! I like your journal page. It oozes summer heat and lazyness. That is a gorgeous photo of your mother! I'm so glad she is enjoying her new environment. Not many old folk like to be uprooted. My mum had to move at 91 and had to go back to living independently after the insurance had moved their goalposts and she was deemed too 'good' for the care home she was in. Fortunately her new apartment is next to the shopping centre and she is very happy. She's practically blind but has learnt her way around the house and to the shops. A good move for her too. Gosh is that a mini frappe? I hate to think what the large one looks like. Served in a bucket probably. Portion size in the US is so huge. I remember I always had to leave half my plate and I also skipped meals. (Very unhealthy). Fantastic pages in your summer journal, all your drawings look great and the pages so detailed. 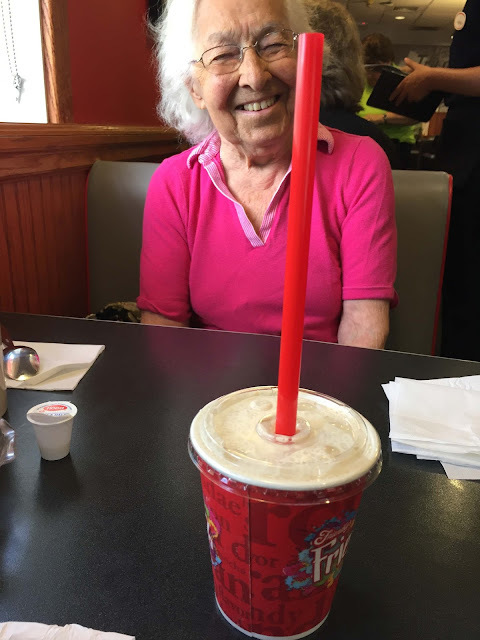 Sounds like you and your mom had a good day out, I had to smile at the length of that straw. Your journal is such a good idea, and will remind you later of good things you might have forgotten. I love all the little drawings and the comments like the ice-cream and "Holiday Manifesto". You seem to be able to do so much, I'm full of admiration. Your Mum looks really happy, how nice to be able to spend time with her. Your Mom is precious with her pretty smile. It must bring you peace of mind to know her new living arrangements are such a good fit. 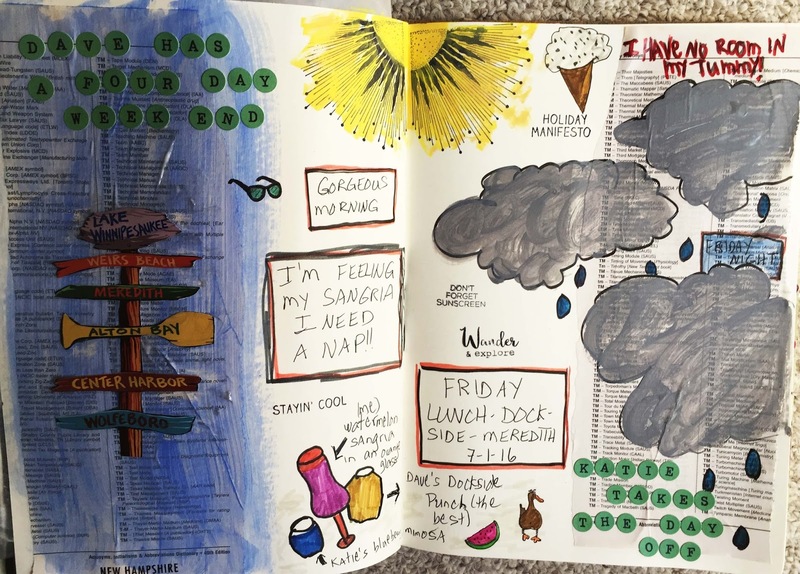 Your journal pages are such fun and what a great idea to do a summer time art journal. I'm with you Erika...how can it be JULY already! Humidity is returning for us too ugh. Oh, I LOVE that your journal is a re-purposed book! so cool...and what a precious photo of your mom, she does look really happy to be spending time with you! happy T day! looks like y'all had a fun day :) I'd have joined your mom in the regular coffee. I tend to gravitate towards a hot cuppa plain coffee whenever that's a choice. Happy T Tuesday! Your journal oages are great and I love love love the header photo...in case I haven't mentioned it enough...I'm a WATER GIRL ♥ Happy T Day...enjoy your summer! 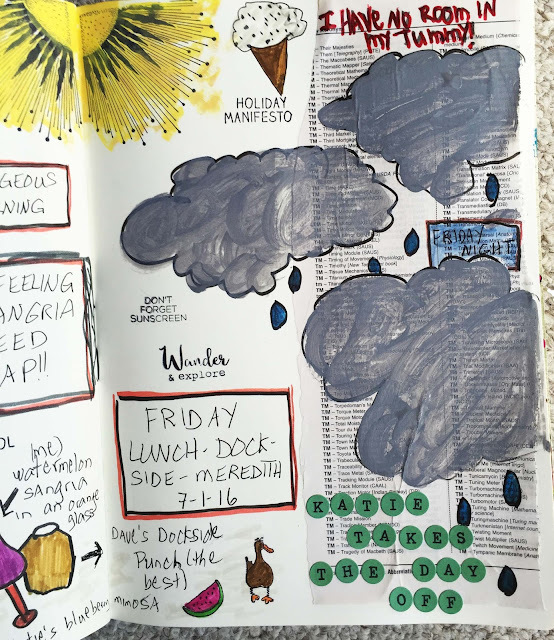 Your pages are fabulous - this style is so free and artsy -- great!!! Your mum is sooo sweet! Thank you for sharing this lovely photo with us and happy T-Day Erika. My kitchen is super ... for me... I am not the luxury type - my dream kitche would have looked quite different but I had to make the best with my budget ---lol. I am satisfied - but not yet finished with all ... as you can imagine...very busy just now daughter makes her driver's license for a moped and I have to bring her to the driving school and many other things on my agenda .. not enough time for art and inet....grrr. Enjoyed your journal pages. Your Mom looks so happy, I'm sure she appreciates your company and the chance to go out to lunch together. nice job with the journal. I have yet to keep up with one such as that. Its a bucket list item for me...spend a year journaling everyday. My mom will be 87 in Sept and is definitely having some memory issues. She couldn't remember my middle name the other day and has some crazy stories coming out lately that I know she's making up to fill the gaps in her memory. It's tough watching that happen. My dad had dementia too. Odds aren't so good for me huh!?! Happy T day....a day late!